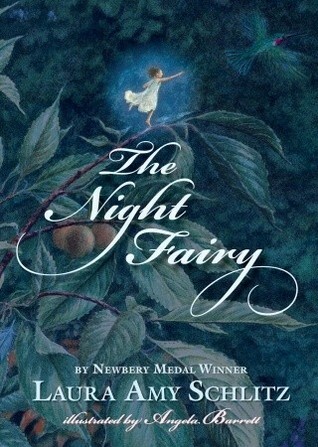 If anyone would have asked me what I thought of The Night Fairy at any time during the first 60 pages (chapters 1-6) I would have found a tactful way to say “bo-o-o-o-o-o-ring.” I had a hard time pushing through the first half of the book. The main character–a night fairy named Flory–was a character in a name only: she did not do or say anything I found interesting. Personally, I am bored by multiple details of building a safe home and finding food (human, animal, OR fantasy). The one break in the monotony comes when Flory encounters a squirrel whom she eventually names Skuggle. THIS is when Flory’s character begins to breathe with life and personality. Initially Flory’s character is so self-absorbed as to border on cruelty in thought and action. When the story finally begins to move at a faster-than-mere-plodding pace (as opposed to a list of actions) Flory has the opportunity to grow and develop: refining her thoughts, beliefs and subsequent choices. The end of Chapter 6 is where my boredom began to dissolve. Here, Flory selfishly tries to blackmail another creature into slavery. Here is the moment where the plot takes a HUGE leap forward in pace and character development. When the creature tells Flory why she refuses to capitulate to Flory’s demands Flory–for the first time–has a flash of empathy and guilt. From the moment Flory reaches out in compassion I couldn’t put The Night Fairy down. Flory navigates around multiple obstacles on a selfless mission. The reader races faster and faster right along with Flory through the suspenseful second half of the book. The characters and events during this extraordinary second half are so vivid I almost felt like I was holding my breath from this point until the climactic ending. In summary, if you can make it through the first few chapters without abandoning the book, The Night Fairy ends up being a heart-stopping journey that is well worth the effort.